Fill in the form “Bespoke Design Order Form” with details about your music, who the composer is, and if it’s used in a film etc. also, let me know if you need the costume for free skating or for dance or for exhibition?! I also like to know if you are you telling a story in your program or what the theme is etc. I’ll then reply via email and we can arrange to have a chat about your costume. I charge a Design Fee of £50.00. This includes 2 changes to the design, and any subsequent designs are charged at £25.00 per design. 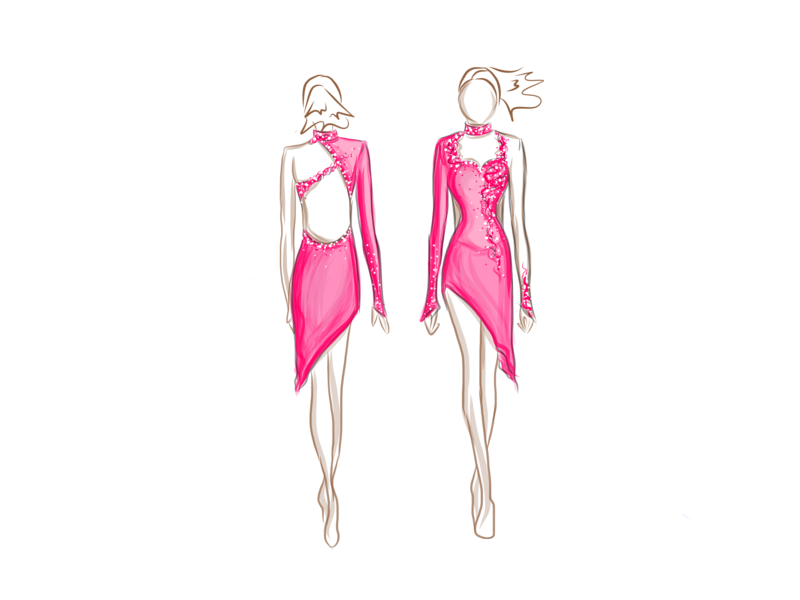 I also like to know who I am designing for, it has to suit you and your personality, so feel free to send pictures, either in skating costumes of practice wear. I will then do lots of research, listen to your music, watch movies that the music is used in, and look at themes and general research which is specific to your costume. Once I feel as though I have thoroughly explored lots of ideas, I will start to design your costume. I will produce a design for your consideration with a quote for the costume. Once the design has been agreed, and we have finalised colours, fabrics and crystals etc. I will then send a PayPal invoice. From there I can order the fabrics and crystals for your costume. I will schedule a fitting with you before any embellishments are added, just to check it fits perfectly. Costume fittings are via eFitting (Skype or FaceTime), the costume will be posted to the address you have provided on PayPal – if you need it to be sent to an alternative address, please let me know. Dresses must be returned using Royal Mail’s Special Delivery service, retain the receipt with tracking code. The remaining 50% balance will be due after the fitting. Please be aware that I can only guarantee the costume will be completed and delivered to you before the agreed deadline if the balance is paid directly after the fitting. I will then complete your costume, adding embellishments and crystals at the final stages. Once the costume is complete, I will email a picture to you of the finished costume. All costumes are posted via Royal Mail Special Delivery, unless you wish to collect in person.